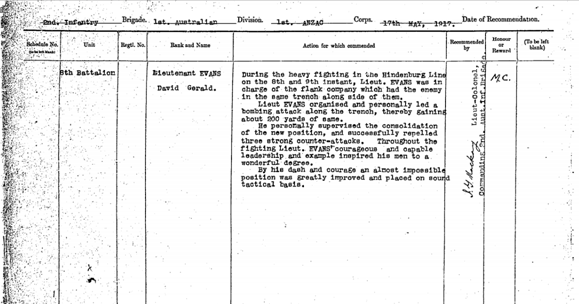 Conspicuous gallantry and leadership during silent raid at Hollebeke on 30 September 1916. Consistent good work. Courage and leadership at Pozieres. An efficient officer with initiative and great ability as a leadeer. Consistent good work and gallant conduct. Courageous and capable leadership enabling an almost impossible position to be improvided and placed on sound tactical basis. Family/military connectionsBrother: Pte Francis Evans, killed in action.